When choosing accessories for your gas grill, you want to choose those that will really work for you. With a rotisserie kit, you will find that you can slide the chicken or other meats onto the spit, start up the motor and let the meat slowly cook for several hours. You can depend on the motor to keep turning the spit since they are constructed with quality in mind. Whatever you decide to slow cook will be held in place by sturdy meat forks. 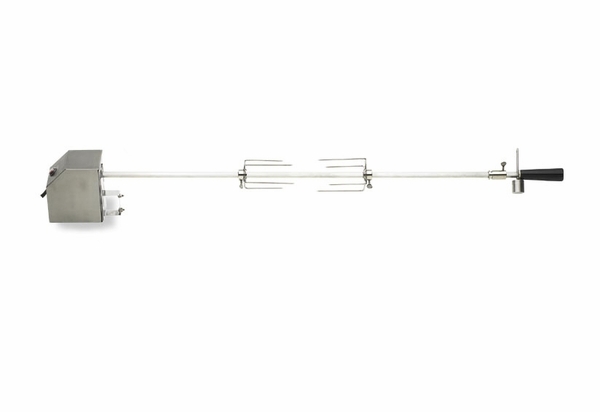 This rotisserie kit is for all Pacifica 960 gas grills as an add-on option or replacement rotisserie. Kit to add or replace a rotisserie. For all Pacifica 960 grills. Spit rod, meat forks and counterbalance included.